Saudi Arabia is largest consumer of red meat among the GCC countries, with meat majorly imported from Australia, USA, Brazil and other countries. Meat consumption denotes the diet, living standards, livestock production, and macroeconomic uncertainty and shocks to GDP. In 2017, beef and veal production in Saudi Arabia was 28,316 MT CWE (metric ton carcass-weight equivalent), which was not sufficient enough to meet domestic demand, thus imported 160,000 MT CWE. As per Saudi food and drug authority report in 2017, importation of goat meat is allowed as per regulations and conditions, whereas, sheep and bovine meat and products importation from certain countries such as from Spain, Jordan, Sudan and Portugal is allowed only from the approved establishments only. Saudis prefer sheep meat over beef and veal, consuming 5.5 kg per capita of sheep in 2017 as compared to per capita consumption of beef and veal. Animal protein is one of the essential protein sources in the diet and growth of human body, making people to increase or shift their consumption to red meat. Goldstein Research analyst forecast that the Saudi Arabia red meat market size is set to grow at a CAGR of 4.3% over the forecast period. Saudi Arabia per capita meat consumption was highest in the world, amounted nearly 50kg. The growth in red meat consumption, production and import of live animals for their auspicious occasion i.e., Eid al Adha feast, utilization of hajj meat that is managed by Islamic Development Bank, rise in import of red meat and government support are some of the major factors impacting the growth of Saudi Arabia red meat market. The report covers the present ground scenario and the future growth prospects of the red meat market for 2017-2025 along with the Saudi Arabia sales and Saudi Arabia revenue of the red meat. We calculated the market size and revenue share on the basis of revenue generated from major players across the globe. We have forecast the market on the basis of red meat manufacturers, red meat import and export data, and production and import of live animals. On the basis of meat type, lamb accounted for highest market share of 47.4% in 2017. Lamb is preferred by the people on every occasion and it is considered as auspicious meal. Shelf stable meat is growing at a rate of 4.9% for its larger preference by the consumers over the frozen and chilled food. 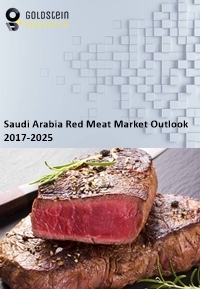 Saudi Arabia Red meat market outlook 2017-2025, has been prepared based on an in-depth market analysis from industry experts. The report covers the competitive landscape and current position of major players in the red meat market. The report also includes porter’s five force model, SWOT analysis, company profiling, business strategies of market players and their business models. Saudi Arabia red meat market report also recognizes value chain analysis to understand the cost differentiation to provide competitive advantage to the existing and new entry players. Online distribution channel for red meat is trending in the country. Consumers had the habit of purchasing fresh meat from butchers, but a shift in purchasing habits and relying of online distributors has influenced the growth of Saudi Arabia red meat market. Government support to not only increase the production and imports of red meat but also to keep quality check is one of the major driving factors growing Saudi Arabia red meat market. Government had imposed ban on beef imports from Brazil and U.S.A. over the quality concerns that were lifted after modified regulations on importing beef meat. Government has offered subsidy support, duty-free imports of raw supplies and interest free loans to suppliers and distributors. Saudis are highly conscious over the freshness of red meat. Government has strict check over the quality and phytosanitary norms and also halal requirements. Supply of rotten or salmonella-tainted meats can also severely impact the red meat demand. There is always a risk of disease spreading among the cattle and contaminating their meat and fulfillment of government regulations are being the major challenges for the suppliers of red meat.